Damage to the roof is one of the top causes of roof leaks and can show up in a variety of ways. The age of your roof makes a difference in how well it protects your home. The materials used in roofing deteriorate as they age. Over time, changes in temperature and weather can cause shingles to crack. This makes them less effective at providing a seal and keeping moisture and water out. If it’s been 20 or 30 years since your roof was replaced, it’s time to contact a home improvement contractor for an inspection and a roof replacement, if needed. Storms and high winds can damage or blow off shingles. This results in an exposed area that can let moisture and water into your home. They may also be out of your sight from the ground. If you feel comfortable doing so, climb up on a ladder to get a view of your roof and check for any areas that look damaged or exposed. If you don’t feel comfortable or aren’t able to climb up and check the roof yourself, contact a local home improvement contractor for an inspection. It may seem obvious that holes in the roof leave your home open to water damage. However, it may not be so obvious that something caused a hole. Homes that used to have a TV antenna or another type of roof installation should be inspected closely. The removal process of those rooftop elements could have left unsealed holes behind. Poor installation of the ridge cap on your roof can also result in holes that allow rain to enter. The ridge cap provides a protective cover over the area where two slopes of the roof meet. If this area is not properly protected during installation or is not installed properly, water will be able to enter and cause roof leaks. These are all signs your roof needs to be replaced. In the cases of missing shingles or holes, it may be possible to repair and seal the area. However, if these are present in an older roof or the damage is extensive, it would likely be a better investment to replace the roof instead. Proper water drainage is important for allowing your roof to do its job. Gutters that are backed up with leaves or debris don’t drain water away from your home quick enough. This may allow the slower draining or pooling water to soak through and penetrate the roof. Installing gutter guards can help prevent debris from clogging your gutters and keep water flowing away from your home. The position of your gutters can also affect drainage. The gutters from your upper roof to your lower roof should extend to the lower roof’s gutter or all the way down to the ground. If the downspout drains directly onto the lower roof, instead of the ground or the gutter, the lower section of the roof can become overly saturated and lead to leaks. In addition to how the gutters are placed and where they drain, roof design can also lead to roof leaks. The slope of your roof determines how steep or shallow it is. There is a building standard to follow, but that doesn’t guarantee yours was built correctly. If the slope of the roof is too shallow, water can drain more slowly and lead to saturation and roof leaks. Also, a shallower slope makes it easier for the wind to lift shingles and for the rain to be driven underneath or seep in during storms. It’s important to use an experienced roofing or home improvement contractor to build your roof to ensure it’s built to the standard and installed properly. Another aspect of your roof that can cause roof leaks are the vents. Roof vents are necessary for your home, but they also penetrate the home, which means they need to be sealed properly. Cracks, gaps, missing nails, or improper sealing during installation can all lead to roof leaks. It’s important for these to be installed and sealed properly from the beginning and then to be checked and maintained over time in order to prevent leaks. Flashing usually refers to the metal roof flashing that is common around the edges of skylights, the perimeter of a chimney, where the roof joins a dormer, or other roof transitions. They act as a seal in areas where large amounts of water may run down, help improve drainage, and prevent absorption and saturation in those areas. Over time, the caulk used on these can dry and crack. This, along with any missing nails, can cause flashing to become loose or slide out of place, which can lead to leaks. Regularly checking and maintaining your roof is imperative to prevent roof leaks. If you’ve just purchased a home or it’s been a while since it was last checked, it’s a good idea to contact an experienced contractor for a roof inspection. This will alert you to any current issues that need to be fixed and will allow you to replace the roof, if needed, before leaks occur. 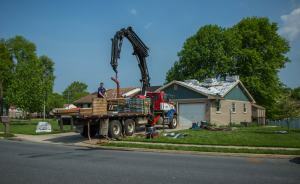 If you have questions about replacing your roof, contact Zephyr Thomas at 717-399-4708! With over 60 years of experience, we’re ready to assist you with any home improvement need.